In 1995 London businessman Ray Santilli launched the alien autopsy film on TV and video around the world to a storm of controversy. Major TV networks including Fox in the USA and Channel 4 in the UK featured the film in major documentaries. To say it caused a sensation is quite an understatement. Ray Santilli maintained then, as he still does now, that he obtained the film while on a trip to Cleveland, Ohio in the summer of l992. This trip was to try and secure old film clips of the early rock ‘n’ roll stars and he did indeed purchase the very first film of the then unknown Elvis Presley. According to Santilli, the man he bought the Elvis footage from had previously been a cameraman for the United States military and in l947 he had been sent to Roswell, New Mexico to film the crash of a UFO. This he did, but not only that, he also filmed the autopsy of the occupants of the crashed flying saucer. A few canisters of film were held back for special processing but because of a military blunder at the time, these were never collected. Forty seven years later, this now elderly gentleman sold these canisters of film to Ray Santilli. The rest as they say is history. Ray Santilli released his film in l995 on an unsuspecting public to such an effect that it has made its way into popular culture. So much so that Warner Bros released ALIEN AUTOPSY the movie in the UK in 2006 and it is due for release in the USA in 2007. British UFO researcher Philip Mantle was involved with the research and investigation of this film right from the very beginning. This book brings together 14 years of research for the very first time. The book looks at the alien autopsy film from every conceivable angle and leaves the reader to draw their own conclusion. Is the film a hoax simply made for money ? Does it instead depict some poor deformed human being with a genetic disorder ? Is it a US military intelligence film ? Or is it the genuine article, the autopsy of a deceased alien ? 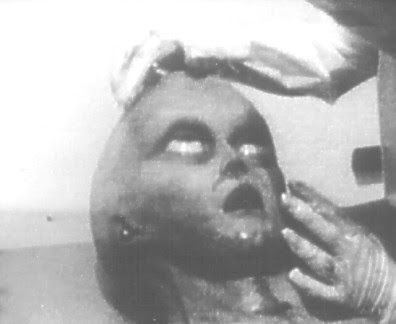 Another Look at "The Alien Autopsy Film"